FROM THE GORGEOUS QUEEN SIMRAN TO THE SPELLBINDING MUSIC DIRECTOR VIJAY ANTONY, THE FIRST EDITION OF TEA AWARDS WAS AN EXTRAVAGANT-SPANGLED CELEBRATION FOR THE SPECTATORS. Chennai: The festival of Ganesh Chaturthi was emblazoned with an intense celebration on its evening. It was a celebration of uniqueness and that’s a new endeavour from Edison Awards crew that has been constantly hosting the grandest events in Tamil Cinema. Last evening, the classical emblem of Chennai – Lady Andal School witnessed the amalgamation of the creative kingpins as TEA AWARDS felicitated the icons based on various criterions. Hon’ble Dr.E M Sudarshana Nachiappan, Minister of State of Commerce and Industry walked on the red carpets that were spread out to the most fascinating personalities in the ‘World of Advertisement’ as well. The most handsome hunk Vincent Ashokan and gorgeous Hema played the perfect host of inviting the winners of all categories to the podium for felicitation. “Gone are those days, where lengthy phrases and duration were utilised to promote a brand. But today, we witness an oceanic revolution of creative minds. Thanks to the youngsters for spearheading with good concepts”, said Honourable Minister Dr. E M Sudarshana Nachiappan. From the most chart-topping tycoon Mr. Mittu Chandliya, CEO, AirAsia, India India to the veteran actor Radha Ravi, everyone was found comely bagging the awards in their respective panorama of advertisement field. “This is one of the greatest honours in my entire life time. Being honoured as the ‘Friendly Guardian Award’ (BEST BANK), I promise that I will keep continuing with my earnest efforts in serving people for the best”, said Mr.Varadharajan, MD of REPCO Home Finance Ltd as he felt paradise on earth during this special moment. What turned to be more fascinating was the reigning queen Simran appearing so pretty much alike her previous days. This was a special surprise indeed. The actress gained the ‘The Tasty Sticks’ Award for her punch of performance in Kurkure (Best Snack Awards). Actor Karan was back in news hitting headlines of fetching ‘The Wind of Jubilation’ Award for his cool show in ‘Mahindra Duro DZ’ commercial in which he shared the screen space with Bollywood’s hottest gal Kareena Kapoor. “I dedicate this award to Lord Ganesha for making this happen”, uttered Karan as he clasped the Golden statue of honour. Ms. Sarala, Deputy Director of Tourism Malaysia walked gained the honours for the sublimate mission of promoting Malaysia across the global maps. In fact, this category of ‘The Journey of Delight’ award (Best International Tourism Ad) was conferred on Ms. Sarala specifically for the special interest of promoting the land of Malaysia with the rich visual attractions. Mr. Mittu Chandliya, CEO Air Asia India showered his praises on each and every responsible for granting him this honour. “Air Asia has become an intriguing part of everyone’s journey on flight. We have been delivering the best service with more offers to make the customers gleeful. We as the team will continue our agenda of exerting the same in future as well”, said Mittu Chandliya. 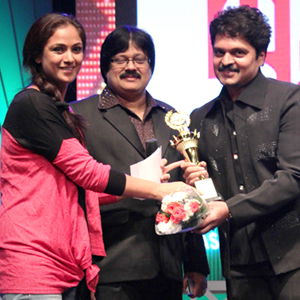 Also present for the occasion were Srikanth, the winner of Best Traditional Ad – ‘The Ethnic Icon’ award for Alaya and Vijay Anthony made a clean sweep as ‘Best Music Director’ for his peppy tunes in FANTA commercial. Communication has become the earnest way of expressing the feelings these days. Of course, the mobile networks on its own course and terms offer the best attractions to its customers in enlivening them. TEA Awards didn’t miss to enrapture us with this special tangible symbol of honour ‘Connecting Hearts Award’ (Best Communication Ad) to Aircel. Ms.Renuka Jayapal, National Brand Head, Aircel Ms. Shankar Narayanan, Regional Business Head felt blissful and expressed their immense thanks to its customer for choosing them for this category. Mr. Selva Kumar, the President of Indo-Malaysian chamber of commerce invited everyone on the behalf of his ‘TEA AWARDS’ crew. Also present for the event was Ms. Chitra Devi Ramaiah, Consulate General of Malaysia to honour the winners.